Children's Classic Literature by Twain, Bronte, Fitzgerald, Hawthorne, Thoreau and more. Of all the insects, none elicit pleasure and curiosity more than butterflies. Whether you are in the mountains or at the beach, butterflies are ever present during your visit to Costa Rica. There is nowhere you can go, whether a 3,000 meter volcanic summit or the dry plains of Guanacaste where butterflies are not present. The list of butterfly predators is long. Suffice it to mention just ants, spiders, wasps, parasitic wasps, parasitic flies, birds, rats, toads, lizards, praying mantis, snakes and monkeys. There is little that would not like to eat a butterfly in one or another of its life stages. Butterflies have developed many ways to protect themselves from their predators. We could divide them into 2 simple groups: good tasting and bad tasting. A butterfly that is good tasting is one that is regularly consumed by large predators like birds, snakes and lizards. A bad tasting butterfly is avoided by large predators due to its undesirable taste. Kids' Chat Rainforest animals, earth science and expat homeschooling in Costa Rica. Ecosystems, environment, geology, earthquakes and volcanoes in Costa Rica. To be good tasting and bright is dangerous for an appetizing butterfly. Therefore the good tasting species camouflage themselves by being dull colors. Bad tasting butterflies are colorful as adults and have toxins in their bodies that make the predator sick. The predator once having suffered the consequences of consuming such a butterfly will easily remember the bright color of the wings. It will know from that time on to avoid that color pattern. Although one butterfly will be killed from such an encounter, many more will live. Female butterflies are programmed to know where and when they will lay their eggs. The males program is to mate with the female at the right time so he has to follow the same pattern. Lets look at this starting with non migratory butterflies. A female hatches out of the cocoon and her program says to mate and begin laying eggs right away in the immediate location. Every female of this species has this program. They will quickly seek a male, mate, and lay their eggs on the hostplant. A migratory butterfly has a different program. The big question is where does this program come from? Also, what triggers the running of the program which, in turn, makes the butterflies leave their present location and head for another. It could be climate conditions , or temperature, or an internal clock that sends them on their way. 1. A butterfly flies by day, and a moth by night. There are some day flying moths and butterflies that fly at dusk. 2. 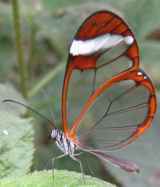 A butterfly always has a feeding mechanism (proboscis), whereas a moth often does not. These moths simply do not eat as adults as they have done all their eating as larvae. 3. A butterfly rests with its wings closed and a moth lands with them open. A notable exception are the butterflies of the Hamadryas genus (Nymphaliinae) that always land with their wings laid flat. 4. 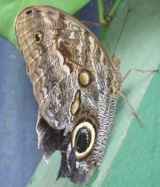 A butterfly forms a pupae hanging. A moth forms a cocoon, usually on the ground.